IDG Ventures-backed Abhiman Technologies Private Limited, which ran a niche online recruitment startup myNoticePeriod.com for those who have quit their jobs and serving their notice period, has expanded its platform to allow working job hunters search for new employers. It has also rebranded itself as Hiree.com. "We found that even those who are still on their jobs and have not put in their papers are available for immediate hiring. So we have decided to expand our reach," Manjunath Talwar, co-founder & CEO of Hiree, said. He said that to ensure relevance and accuracy of the data base, the website would continue with its existing model to ensure only active job seekers. The startup keeps a job search profile active only for a period of 90 days unless candidates opt for renewal; a strategy different from legacy job portals that keep millions of profiles of job seekers all through the year. "We are not going after building a database of millions of candidates. We want to identify those who are very actively looking for opportunities and can join fast," said Abhijit Khasnis, another co-founder and COO of Hiree.com. 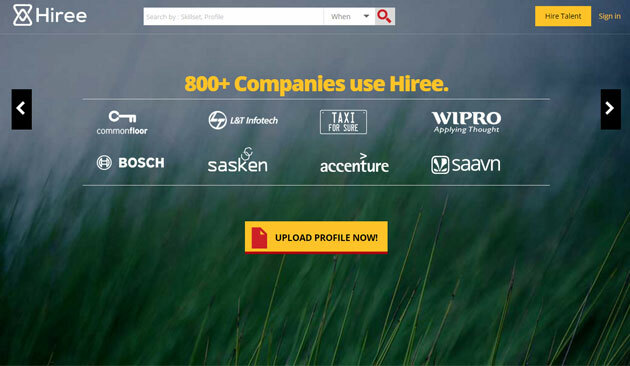 Hiree claims to have more than 800 paid customers or recruiters including leading IT services companies and startups in the country while the number of profiles on its website crossed 170,000. Founded by two Yahoo middle managers IIM Kozhikode alumnus Talwar and BITS Pilani alumnus Khasnis in May 2013, myNoticePeriod.com went live in January 2014. The company started with an objective of helping recruiters reduce lead time for hiring by creating an exclusive database of readily available candidates; an idea that was born out of the drag in hiring process that the founders had faced in their previous jobs. It raised Rs 2 crore in seed stage backing in September 2014 when it was running with just half a dozen people including founders and being incubated at Nasscom 10000 Startup Warehouse programme. The money was raised from IDG Ventures India, with participation from a group of individuals including Prashant Kirtane, CTO and co-founder of travelmob.com; Shamsunder Talreja, owner of JetSet Capital; Raghu Krishnananda, former senior director (product engineering) at Yahoo; and Ravi Gururaj of Frictionless Ventures. It raised Series A funding of Rs 18 crore from IDG Ventures in February this year. Talking about future fundraising, Talwar said, "In normal case we would be raising only after 18 months from our Series A round. But we are getting a lot of inbound interest and will raise well before that."